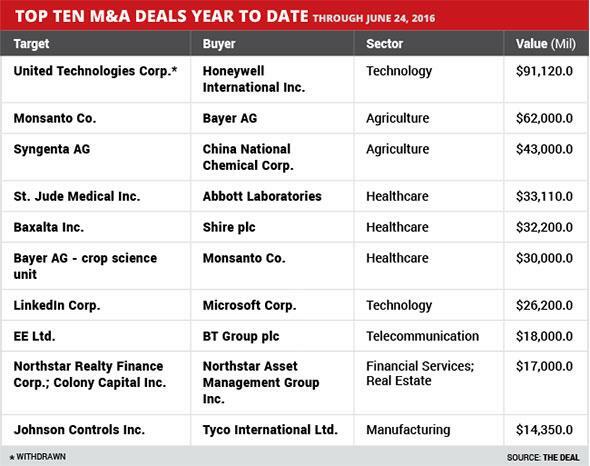 M&A activity continues to show prominence of middle market deals, unfavorable comparisons to a year ago. This week's merger and acquisition activity provided a stark reminder, if one was needed, that not all hookups are constructively received by the market. The most notable deal of the week found Tesla (TSLA - Get Report) bidding $2.8 billion for SolarCity (SCTY , the maker of solar panels. Tesla's well-known chief Elon Musk touted the merger as an initiative that would create the first "vertically integrated energy company," marrying Tesla's electric cars and energy storage systems with SolarCity's solar panel products. The offer represented a 21% premium to SolarCity's share price, which has dropped from a 12-month high of $61, to $21 recently. Wall Street wasn't nearly as enthusiastic about the deal as Musk. Tesla shares lost 12% in after-hours trading following the announcement of the linkup. Part of that owed to the less than hand's off character of the transaction. Musk owns 20% of SolarCity. A cousin of his is its chief executive. Musk distanced himself from the oversight of the transaction, saying it would have to be the decision of independent shareholder interests that ruled on accepting the deal. Others worried that the money-losing SolarPower operations would sink the balance sheet of Tesla, which recently undertook a $1.4 billion stock sale of its own. One sell-side analyst projected just a 20% to 40% likelihood the transaction would take place. 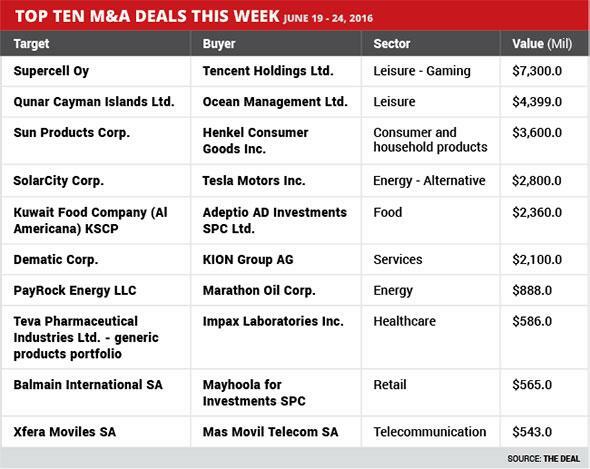 Meanwhile, it marked another somewhat logy week for the M&A market. Jim Cramer, founder of The Deal's parent, TheStreet (TST and manager of the Action Alerts PLUS portfolio, said on his CNBC television program this week that the market was ripe for consolidation, but that he wasn't seeing an appropriate level of M&A activity. Cramer stated that the economy has "too many of everything," including retailers, airlines, banks and restaurants, but that the consolidation taking place hasn't been powerful enough to redress the problem. Once again, as has been the case all year, the market has seen a powerful uptick in the number of deals undertaken versus the past two years, but at substantially lower price points than had been the case in those periods, suggesting the transaction activity has been centered on middle market deals, rather than megacap asset swaps. The number of transactions announced year to date in 2016 stands at 3,344, a 60% bulge over the 2,070 struck to this point last year, and larger than the 2,303 in the banner year of 2014. Despite the surge in announced transactions, the volume has declined, to just under $1.2 trillion year to date, versus $1.3 trillion at this juncture last year. Nearly halfway through the year, the total dollar value of transactions has retreated 8%. One of the largest M&A transactions of the week reflected one of the biggest trends involving China-based companies: Chinese companies that are listed on U.S. exchanges getting offers to go private so they can relist in China, where public valuations tend to be larger than in the U.S. In this week's transaction, Ocean Management launched a $4.4 billion nonbinding proposal to buy Qunar Cayman Islands (QUNR , China's leading travel booking website. Ocean Management -- a unit of Ocean Imagination, a private equity fund that invests in travel industries in China -- said it would seek to win the approval of Qunar shareholders, including its largest shareholder Ctrip.com (CTRP - Get Report) , China's largest online travel portal and a portfolio company of U.S. private equity firm Silverlake Partners. Meanwhile, in the biggest announced M&A transaction of the week, Tencent Holdings, a China-based media and internet company, said it would buy up to 84% of Supercell Oy, the Finnish gamemaker best known for its "Clash of the Clans" game title. Tencent itself has been involved in transactions for Chinese online travel enterprises, reflecting the broadening appetite for outbound tourism activities on the part of China citizens. Tencent is paying $7.3 billion for the 72% stake in Supercell held by SoftBank Group, the Japanese telecom concern that is the majority owner of Sprint (S - Get Report) . For SoftBank, the sale of its interest in Supercell is the latest in a spree of divestitures aimed at reducing the company's roughly $80 billion in debt. Earlier this month, SoftBank said it will sell a total of $8.9 billion worth of securities in Alibaba (BABA - Get Report) , the huge Chinese e-commerce platform, bringing down its holding in the company to around 28%. SoftBank also recently announced it would sell a majority of its stake in game publisher GungHo Online Entertainment, the business it originally partnered with in 2013 to take the position in Supercell. This article originally appeared in The Deal, a sister publication of TheStreet.com focused on deals and dealmakers, on June 24. For more information about The Deal click here.